When Mr. Boyce moved to Sioux Falls, the city was just beginning to experience the boom that would make it the “Queen City of the Dakotas.” At the time of Mr. Boyce’s arrival, Sioux Falls boasted a downtown of just one street, Phillips Avenue, which was lined with one- and two-story frame buildings with false fronts. Sioux Falls was a growing city and Boyce’s firm thrived. As the city grew, the law firm also expanded to meet the changing needs of its clients. Over the years, our firm has served many of the city’s largest and most successful businesses. Those relationships and our long-standing history give us the insight, expertise and experience you want from a law firm. Our lawyers have a long history of appearing in the South Dakota state and federal courts and before administrative agencies. We are committed to serving not only our clients, but also the State Bar of South Dakota and our local communities. We recognize the importance of giving back to the community and state. We participate in many charitable and philanthropic activities and have attorneys who have served as board members and volunteers for the Sioux Falls Area Chamber of Commerce, Development Foundation, Forward Sioux Falls, United Way, other civic and service organizations, and charitable, educational, religious, and health care agencies. Throughout our history, we have been committed to providing a leadership role in moving Sioux Falls and South Dakota forward. With a long and rich history in downtown Sioux Falls it was only fitting that the firm moved into one of the City’s most historic and storied buildings. In 2011 the firm moved into the historic Wintersteen Chevrolet building. The historic building has been a mainstay on the corner of 11th Street and Main Avenue for decades. 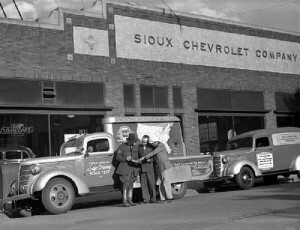 It was constructed in 1928 and over the years served as the dealership for Wintersteen, Trager Chevrolet, Sioux Chevrolet and Jay-Shon Chevrolet. The building was completely renovated, receiving the 2013 Mayor’s Historic Preservation Award. It currently serves as the state-of-the-art home of the firm. In addition to the legal experience and expertise possessed by our attorneys, our dedication to the welfare of Sioux Falls, South Dakota and the South Dakota State Bar has been a critical part of the longtime success of our firm. We believe that Frank Boyce would be proud of the firm he founded and the City and State he chose to call home in 1878.